[Gameplay Access] Click on the "Auction" right below the small map on the higher right corner of the screen. [Requirement] The character reach lv. 40. * Legendary and above Relic, Rune and some other items can be traded here. Players can bid and trade freely. * Auction is an X-server system. Players from the same X-server Zone can trade with each other. * Only recharged diamonds can be used in Auction. * Each bid increase the previous price by 5%. * Players can search for Relic that enjoys corresponding stats in the search box on the left. 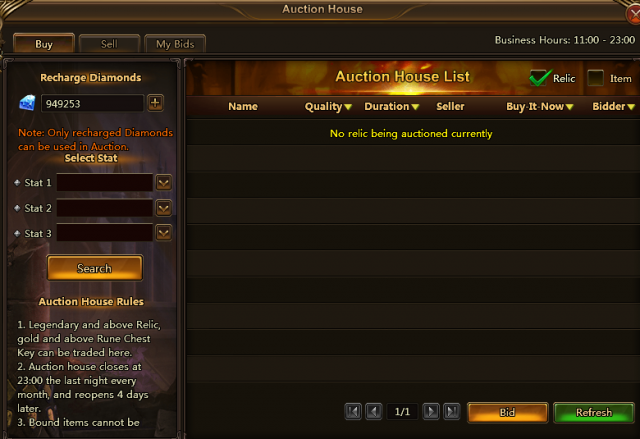 * Players can set auto-bid so that you do not need to stare at Auction all the time. * If a player get a deal, the auto-bid system will return unused diamonds; if the player fail to get a deal, the auto-bid system will return all of the diamonds. * Only unbound Relic can be traded in Auction. Once Relic has been enhanced/socketed/equiped, this Relic became bound and nontradable. * Players can get diamonds from successful sales. However, earned diamonds from Auction may not be used in Auction again.